I was so fortunate to be asked to have one of my latest pieces from the Sediment series be on the cover of the academic STEAM Journal out of Claremont Graduate University edited by Sara Kapadia. I was also asked to write about the series, specifically how science has played a role in my art practice. Ideas of mapping, topography, erosion and evaporation have been loosely connected to my work for several years now. In my latest series I have put more of a focus on those ideas. In particular I am interested in the movement of sediment pushed by a flow of water and then left, stranded in a new location, as that water source dries up and diminishes. 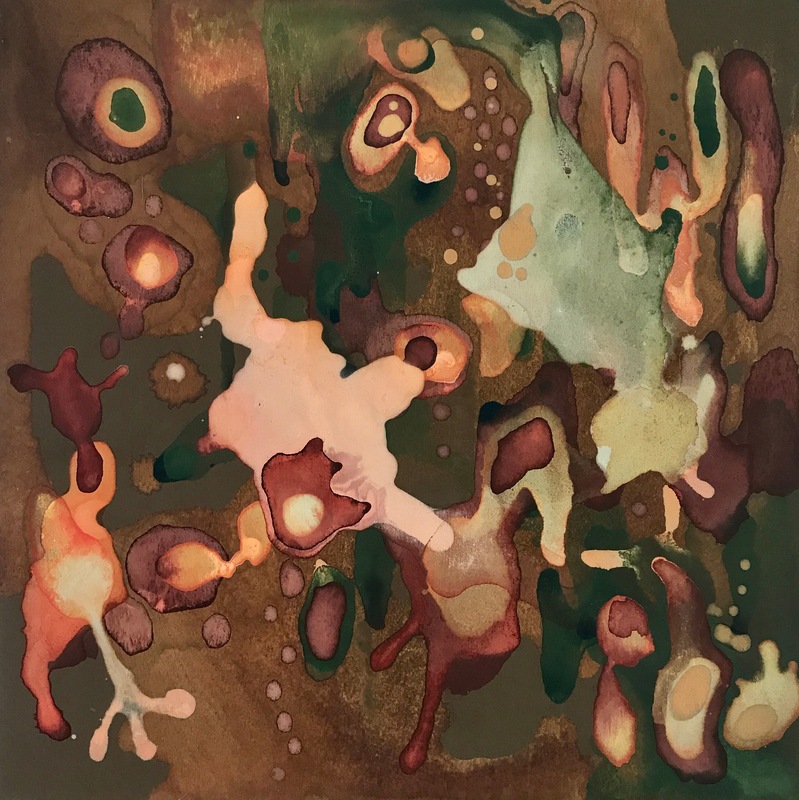 The pigments of the ink in the paintings are my sediment that I build up layer after layer to create a mini geological world caught in a moment of shift, pause and flow. The way in which I make my paintings is very experimental in nature. The outcome of the painting is for the most part out of my control once I set the process in motion. To begin, I mix water with acrylic ink which allows the pigments to separate. I then pour or drop the solution on a support surface. In this series it happens to be wood panels. Moments after the pour I have a brief opportunity to manipulate the ink by dropping in additional pigments or “pulling” the water pigment solution out in different directions using the tip of a pipet. Much the way shifting sands of the beach get pushed around by tides and storms or the same way the moon pulls on the tides, I pull and push the flow of color. From there the final outcome is left up to gravity and the way in which the water evaporates and leaves behind the once suspended pigment. This process is then repeated over and over again building up layer after layer upon the surface. Each layer is set up as a response to the layer beneath. However ultimately environmental elements have their influence: gravity affecting the degree of flow, and heat determining the rate of evaporation. This build up of pigment creates a topographic world, where shifting and flowing pigments like tiny grains of sand are frozen in time. The ever changing topographies of our landscapes are shaped by wind, rain, floods and ice – carving valleys, shaping beaches, shrinking mountains and building them back up again. One can compare the shifting layers of sand, dirt and rock to the complex layers of humanity which are always evolving. Just like in the study of geological shifts there are always new discoveries that cause our perspective to change. This quest for understanding is paralleled in both the artistic and the scientific practices. Through my own art practice I hope to create a space of self reflection and bridge the gap between pure scientific facts and the human experience.